What choices to create your portfolio? This portfolio template is the latest created for Dustfolio, we have particularly cared for the user experience with a quick zoom effect that allows to always place the enlarged images on the homepage. The arrival of content pages is fluid and avoids reloading the page. The contact menu will finally allow you to have a permanent link with your customers. The classic model is a current variation of the historical model of Dustfolio. Like the other two models, it perfectly manages the responsive design aspect. The principle of "contact sheet" under the headings allows to keep an overview of the works. You also have the option to add a menu at the top of the page, which points to the homepage, the portfolios and the content pages respectively. The particularity of this model is the possibility of adding a home page with for example the content "a homepage", or a simple image. Can I try a model without losing the settings of my book? Yes, the book settings are independent from one model to another. You can always return to the original template with your original settings. The content of images and pages is common to all models of books. You can always return to the original template with your original settings. The content of images and pages is common to all models of books. Which model do you recommend to start? 2. The header of the model (the logo / visual of the book) The top band is the same for the 2012 and 2012-slide model? Yes, (This is the banner of the classic model that is different). The 2014 – responsive model uses a square format of 215×215 pixels, you can use a PNG image with transparency. How do you put the 215×215 pixels logo or logo on the book's presentation page? 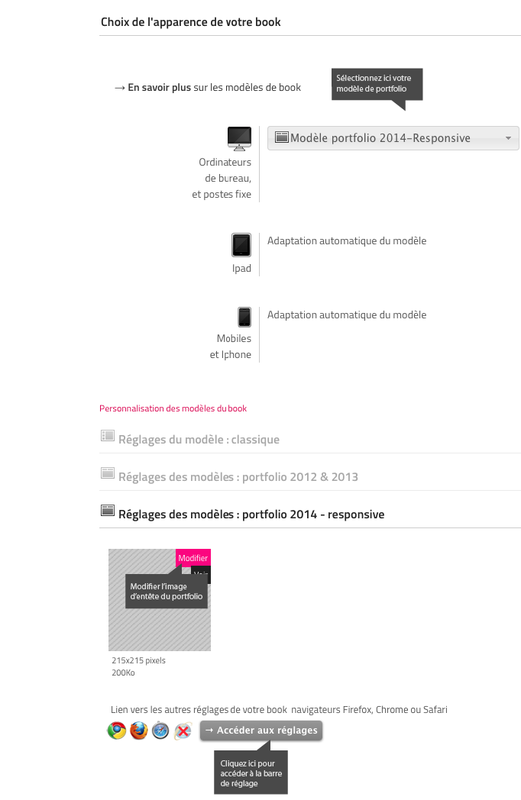 You go to the menu "Personalize my book" Then on the tab "Model settings: portfolio 2014 – responsive". Click on the "Edit" image and drag and drop your new visual. 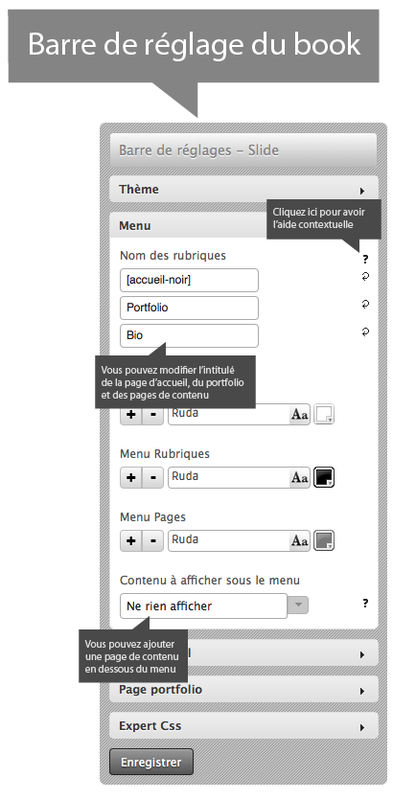 How to customize the settings of my portfolio? How does the portfolio adjustment bar work? Is the adjustment bar visible to visitors in my portfolio? No you must be connected to your administration to view it, so you do not have to worry about his presence. There is no adjustment bar on the classic model? Yes, it's normal, it does not use it.